﻿ Russian Test - Are you a real expert in Russian souvenirs? 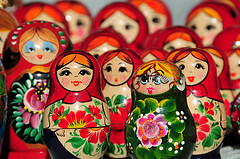 Are you a real expert in Russian souvenirs? Take this test as a virtual trip to Gorod Masterov, a huge souvenir market in Moscow. If you manage to do it well, you'll earn a personal virtual Russian gift in the end, so good luck!